Happy Spring! Well, at least the calendar says it is spring… who knows what the weather will be like each and every day – lol. Today I’m going to take you on an early simple spring home tour! If you are visiting from Blue Sky at Home thanks for popping over. And if you are a regular reader around here, I am participating in a spring tour blog hop that has been going on all week, so you are in for lots of inspiration! Make sure to check out all the other posts from the tour at the bottom of this post. So my name is Christina and I love all things frugal, all things home, and all things decor and DIY. I have a passion to truly make my house a home but do it on a frugal budget. I am mommy to an almost 2 year old little girl who will probably pop in and say hi later in the tour 🙂 … so along with her and fixing up a new to us/somewhat fixer-upper home, I keep very busy! You can see before pictures of our home here, one year progress pictures here, and all of my past Spring decor here. So come on in and I’ll show you around! Spring has been playing hide and seek this year so I haven’t planted flowers in pots or gotten the whole front porch cleaned up and decorated yet because it has been just too cold. But I did winter my ferns from last year and was ready to get them out of the house – hoping they will perk up a bit. We got new living room couches (the Ektorp series from IKEA) before the holidays. And a lot of my old pillows just didn’t blend well or had seen their last days. So I am slowly working on gathering new pillows and ended up incorporating a deep teal blue for spring and I have to say I just love it! I love white, green and yellow – just screams spring! And adding in that deep blue just worked so well. I found the blue pillow covers on markdown for $4 on a recent trip to IKEA and I just happened to have 2 secondhand find throws that matched that color perfectly! And we are quite enjoying them on the hearth! I did a simple spring mantel but I just love it! I love this shiplap backdrop – it is on the back of a large sign I used for Christmas. Love that I can get 2 uses out of it! Just a simple arrangement on the coffee table of some spring items on a DIY pallet wood tray. This dresser/console table area is about to undergo a huge change which I can’t wait to share. But for now I added some simple spring decor. Live simply – that seems to be becoming more and more of my mantra lately. I don’t add a whole lot of spring all over the house but I did have fun with a message on my letter board. I need that reminder every day! And just some simple faux stems in a white pitcher adorn the kitchen table along with a yard sale spring wreath hung on the door. So there’s our simple spring home tour! I plan to share our spring yard and front porch when the weather finally cooperates. I truly enjoy being a homemaker and making our house into a home and I hope I can inspire you to do the same even if you only have a yard sale budget too. I won’t take time to point everything out but in every picture I could point out again and again things I have found secondhand, painted or DIYed to fit our home, or found a bargain on someplace. I hope you found a new idea or were inspired in some way for your home. But the pretty spring pictures don’t stop here! The next person on the tour is A Purdy Little House – be sure to visit her and all the rest of the links from earlier this week below. I love your pretty wreaths – so smart to turn the Christmas sign around, it looks great! 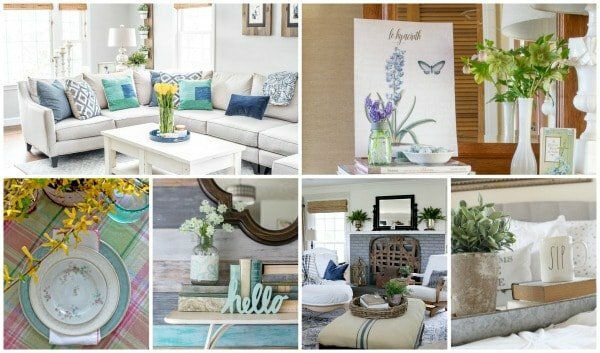 Your home is so nicely styled for Spring. I love all the yellow flowers and your little helper is adorable. Cheers. Oh your little helper is adorable!! I love the combo of blue and yellow for Spring, too! You have a lovely home and a lovely daughter! I can’t believe she’s that big already! Christina, I love your new blue pillows mixed with the blue throws. And the pops of yellow are wonderful for spring. Great little vignettes, too. Happy to be on the Spring Home Tour with you. Christina – you had me at your front door, and then when I went inside – I fell in love! 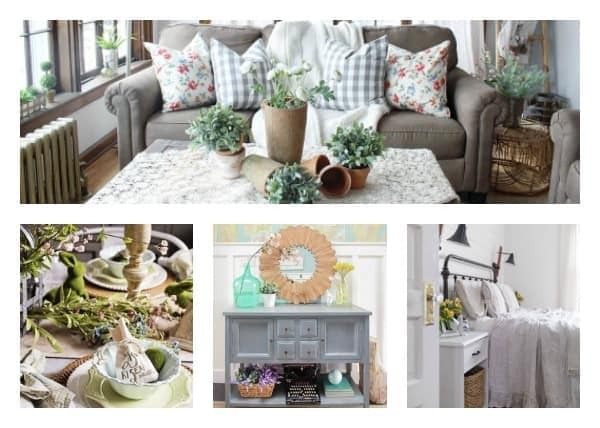 All the details are perfect and intentional to creating a beautiful palette for Springtime! Love the clock! Where did you purchase it or did you make it?